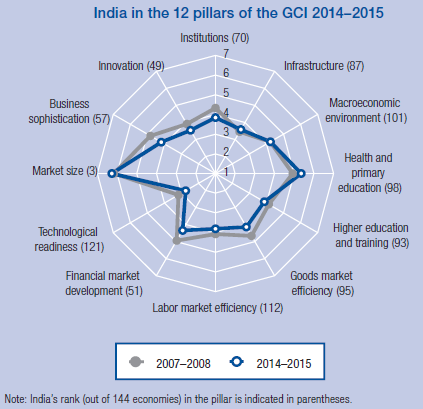 The World Economic Forum's (WEC’s) latest “Global Competitive Report 2014-15” has alarmingly found that India has slipped by 11 points in global competitive index (GCI) over the last one year. 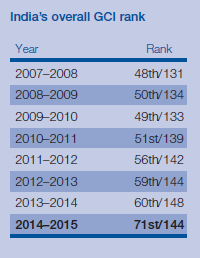 Ranking No 60th in 2013-14, in 2014-15 it ranks 71st, asking the new Narendra Modi government to focus on "improving competitiveness in order to put growth on a more stable footing" on a priority basis. Seeking to accelerate what has come to be known as neo-liberal model, the WEC believes only a high rate of growth, increasing public-private partnership, and global investment would fight poverty. Refusing to suggest any measures that would end India lag in the social sector, the report states, "At 28th, China stands some 40 places ahead of India, the other regional economic giant", adding, "Despite its immense potential and promise, by many accounts India continues to suffer from poverty. A third of its population still lives in extreme poverty—possibly the highest incidence outside sub-Saharan Africa—and many people still lack access to basic services and opportunities, such as sanitation, healthcare, and quality schooling." Wanting the Modi government to work policies that would "accelerate" India's growth, the report states, "Since 2011, India has experienced a slowdown. In 2013, its economy grew by a modest 4.4 percent.” Pointing out that at 71st position India “is the lowest ranked among the BRICS economies”, the report says, “The rank differential with China (28th) has grown from 14 places in 2007 to 43 today; while India’s GDP per capita was higher than China’s in 1991, today China is four times richer.” Pakistan, however, ranks much worse than India, 129th. 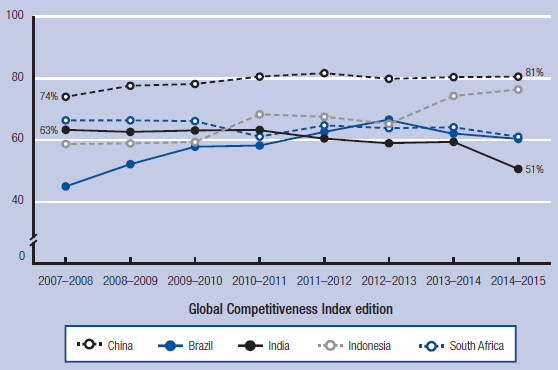 Pointing out that "India’s slide in the competitiveness rankings began in 2009, when its economy was still growing at 8.5 percent", the report states, "The country has declined in most areas assessed by the GCI since 2007, most strikingly in institutions, business sophistication, financial market development, and goods market efficiency." It adds, “The health situation is indeed alarming: infant mortality and malnutrition incidence are among the highest in the world; only 36 percent of the population have access to improved sanitation; and life expectancy is Asia’s second shortest, after Myanmar." The report says that while India may be on track “to achieve universal primary education”, it stresses, “The quality of primary education remains poor (88th) and it ranks a low 93rd in the higher education and training pillar of the GCI. Transport and electricity infrastructure are in need of upgrading (87th).” It adds, “Given the country’s strained public finances, addressing the infrastructure gap will require very strong participation on the part of private and foreign investors through public-private partnerships." 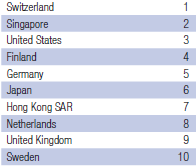 Even then, it says, “The overall business environment and market efficiency (95th, down 10 places) are undermined by protectionism, monopolies, and various distortionary measures, including subsidies and administrative barriers to entry and operation."